A gazebo on your patio or in your garden evokes images of Arabian Nights and fairytales. Gazebos have a very old tradition especially in Asia and the Orient. During the Baroque era, garden gazebos made their way into the gardens and parks of the nobility and then spread to the gardens of the bourgeoisie as well. Even back then, gazebos were a popular garden design element and used for receptions and parties. And today, Unopiù’s designer garden gazebos are an elegant and luxurious way of designing the garden with eyecatching highlights. 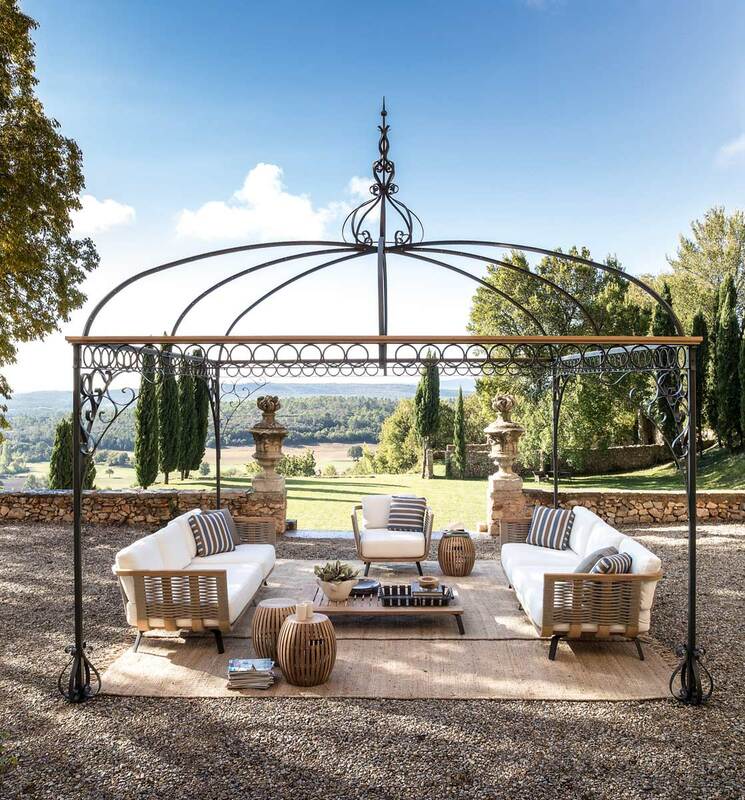 Our contemporary gazebos can be used as a quiet spot to relax and unwind, as a romantic place to have your garden parties or weekend brunches, as a beautiful lookout, or simply as a structuring element to enhance the individual atmosphere of your garden or your patio. Our garden pavilions are available in different sizes and shapes so that you can find the perfect match for your outdoor living area. The outdoor pavilions have a structure of galvanized iron with powder coated finish in graphite or white and come complete with a waterproof cover which is champagne coloured for the graphite structure or white for the white structure. The gazebo kit also includes a galvanized sheet metal gutter as well as stops for fixing posts to the garden ground. These posts also double as downpipes. The contemporary garden pavilion’s finial, pelmet, and curtains give it an enchanted look evoking the fascination of magic Arabian nights in the desert. It creates an engaging and harmonious atmosphere. Both the pelmet and the curtains are available in matching colours (champagne pelmet and sand coloured curtains for the graphite pavilion, white pelmet and white curtains for the white pavilion). The curtains are 100 % acrylic fabric. The gazebo can quickly adapt to all weather conditions and gives you an exclusive and romantic room in your open spaces.